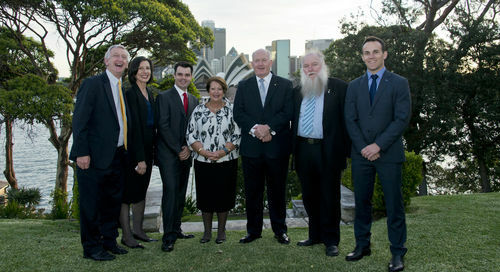 Hosted by Their Excellencies General the Honourable Sir Peter Cosgrove AK MC (Retd) Governor-General of the Commonwealth of Australia and Lady Cosgrove at Admiralty House, TAD celebrated 40 years of innovation and changing the lives of people living with disabilities. The evening began with a special viewing of an anniversary video commemorating TAD’s humble beginnings and encapsulating TAD’s vision for the future. Joined by the Hon. John Ajaka MLC, Minister for Disability Services representing the Premier, TAD volunteers, supporters, state MPs and Suncorp representatives TAD celebrated 40 years of delivering our niche service. Thanking everyone in attendance the Governor-General was pleased to be speaking to and about TAD’s volunteers and his first encounter with TAD last October, where he and Lady Cosgrove toured head office and the Northmead workshop. He spoke in high regard to those who generously give their time, skills and expertise to meet with clients, design and subsequently build products to meet each individual’s needs. The Governor-General acknowledged the immeasurable impact that a Freedom Wheels bike can have on not only a child’s life but their families as well addressing the incredible work put forward by TAD’s volunteer force. Thanking Their Excellencies for generously hosting the celebration, Chief Executive Officer Danny Kapustin reiterated the wonderful work TAD accomplishes and acknowledged those who have supported TAD over the last 40 years. He spoke about his vision for the future and the aims of strengthening relationships with government, the corporate sector, universities and other organisations to meet the needs of people living with disabilities. “One of the things about anniversaries is certainly reflecting on the past, but for me one of the things I’m very clearly focused on is our future.” Danny said. TAD is an incredibly unique organisation that has filled a niche doing amazing work for the last 40 years and I am confident that it will continue that work for the next 40. Sometimes the simple things in life make a really big difference.” Danny finished. With formalities concluded guests spread out over the verandah and gardens enjoying the breathtaking view of the Harbour and the Sydney Opera House.